Sydney’s racing chiefs have claimed a points victory after a bumper crowd on Everest Day at Randwick closed a week of controversy for Australia’s richest, and now most controversial, horse race. After more than 300,000 people signed a petition during the week opposing The Everest’s Opera House barrier draw lightshow and many critics dismissed the race, a crowd of 40,578 punters and partygoers ignored the lingering rain to squeeze into Randwick racecourse on Saturday. It well outstripped last year’s crowd of 33,000 and vindicated NSW racing authorities who were forced to close the Randwick gates before Redzel won his second Everest in succession. Redzel received a huge ovation as he led the 1200m sprint most of the way to claim the $6 million purse by a length and a quarter from Trapeze Artist, with Osborne Bulls third. 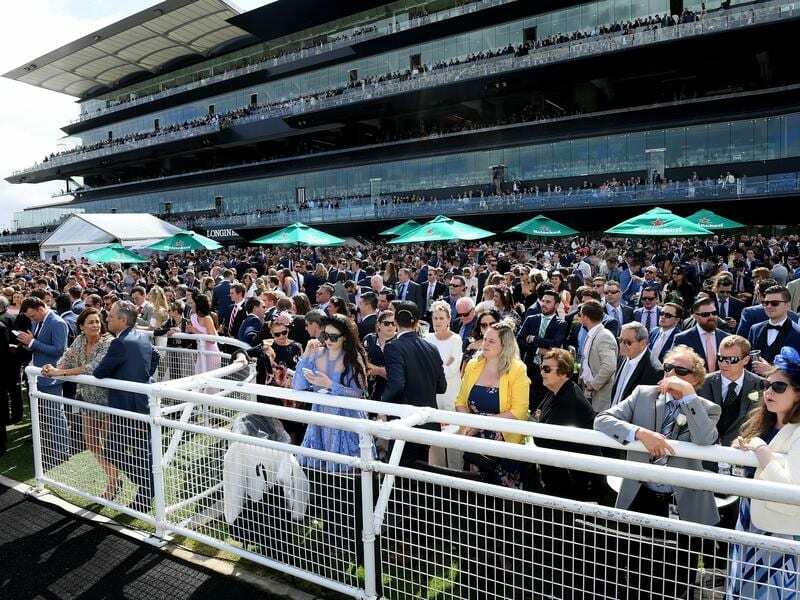 “It’s great for Sydney racing to make a stand like this and be such a significant event in this city,” Australian Turf Club chief executive Jamie Barkley said. And the biggest Randwick crowd since its 2013 redevelopment proved any publicity is good publicity after The Everest drama achieved saturation coverage, mostly negative. Mr Barkley said the backlash against the barrier draw being beamed onto the Opera House sails was not a factor. “It had no impact on the racing enthusiasts,” he said. He said 78 per cent of tickets were sold to the under 35s, the target audience of Racing NSW chief executive Peter V’landys, the mastermind behind the bold creation of the $13 million sprint last year. Mr V’landys unashamedly declares he wants The Everest to “disrupt” racing in Australia and welcomed the partygoers to their first race meeting. “I’m just very thrilled we again attracted the under 35 audience. This race is for the new generation to make their own and they’re doing that,” Mr V’landys said. But for pure racing, it couldn’t disrupt Melbourne’s dominance at this time of year, with four Group One races and a Cups qualifier at Caulfield on Saturday. The Autumn Sun confirmed its status as Australian racing’s next big thing with a dominant win in the Caulfield Guineas while Irish import Yucatan moved in betting for the Caulfield and Melbourne Cups with a clear win in the Herbert Power Stakes. And while the Everest strives for global recognition and welcomed its first overseas runner in US Navy Flag, Yucutan was one of around a dozen international horses at Caulfield. But with a crowd of 22,000 at Caulfield, The Everest wins that contest.